I'm not going to pretend I didn't give myself a headstart and begin sewing on Sunday night,.... But I had to start sewing to prevent myself from cutting anything else out! The dress fabric is from Lillestoff and I purchased it when I was on a quality ribbing hunt. It snuck it's way into my basket when I bought half a dozen each of the different thickness ribbings from Ottobre's online shop. I'm pleased to say the ribbings are brilliant. None of the ones I ordered ended up matching the colour that I needed for original project but they are worth having in the stash for when I am overcome with the need to splash a bit of colour around! P.S. Yes, that's a Band-Aid in her hair. Big brother failed to think through the potential outcomes of bouncing on the trampoline with his little sister and a plastic light saber in his hand. Amazing how gashes to the head can bleed, isn't it?! Oh you should. This is the dress pattern that makes me want a flatlocker machine as I'd love to do exposed contrast coloured seams. Then I'd have another machine to fool around with. Bliss! This is a fabulous dress and so bright! I love it. Nice job with the band aid too although I don't think it will be pretty when you have to pull it off. Thanks JWo. I seriously considered clipping a patch so I could get a better dressing on there but vanity won over haemostasis and the hair remained. I recommend a long soak in the bath before removing the Band Aid. I love the dress, and her obvious willingness to model it so delightfully! Yep, that's how we did it. I knew this dress would be a huge hit. If pink deer and squirrels weren't going to be a success then what would?! I love this so much! So much fun. I have totally eyed those Ottobre ribbings! Why are colored ribbing fabrics SO DARN HARD TO FIND, I ask? WHYYYYYY. Those are spendy, but it's good to know you think they are good quality. The ribbings wouldn't be expensive if the same shop didn't happen to sell printed knits like this! The single knit (1:1) is perfect for neckbands like this and the double (2:2) is more like a sweater knit cuff. For a real jacket hem cuff (leather jacket or similar) you'd probably want slightly thicker again. I love the bright colors of this outfit, Shelley! Very cute! Thanks Cindy. Not what might have been expected from me, but I enjoy seeing her wearing it. Fun outfit! Is a flatlocker the same as a overstitch machine?? I had no idea there were so many different kinds of sewing machines out there! Ummm.... I don't think so. When I went to buy my overlocker I was all set to pay for the twice as expensive model that did coverstitching. The salesman asked me why I wanted that and I described the dress that I (still) want to make with stitching at the seams that looks like overlocking. That, he said is a flatlocking machine and is not really affordable or practical for the home sewer. He talked me out of the coverstitch/overlocker machine and down to the basic model overlocker. This is such a fun dress! What delightful fabric:) Hope her "owie" is healing well. Kid's Clothes Week: It's a wrap. 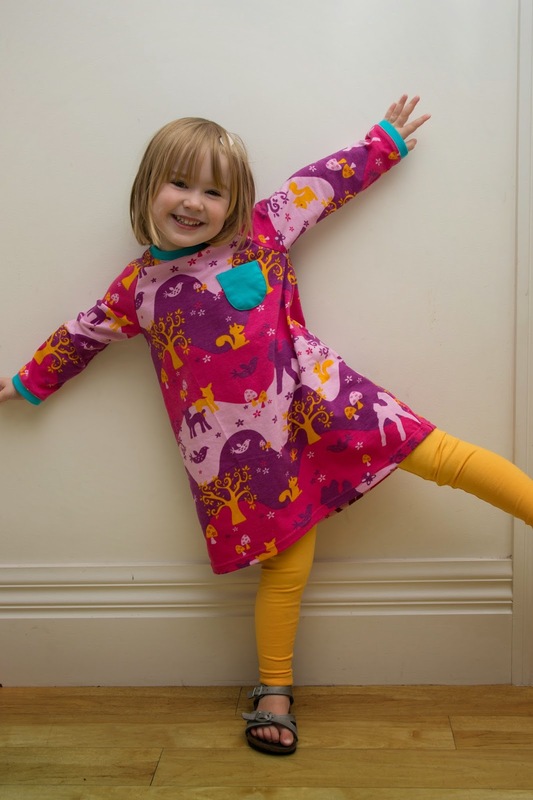 Kid's Clothes Week: Mini Me!